With the prospect of a government shutdown apparently decreasing, the public by a wide margin says that any congressional budget agreement must maintain funding for Planned Parenthood. The latest national poll by the Pew Research Center, conducted Sept. 22-27 among 1,502 adults, finds that 60% say that any budget deal must maintain funding for Planned Parenthood, while 32% say that any agreement must eliminate funding for the organization. If lawmakers fail to agree on a budget and the government does shut down, more say the Republicans (40%) than the Democrats (26%) would be more to blame; about a quarter (23%) volunteer that both sides would be equally to blame. Before the previous government shutdown in October 2013, when asked whether Republicans or the Obama administration would be more to blame if no budget agreement was reached, 39% said Republicans would be more to blame and 36% said the Obama administration (17% said both equally). There are stark partisan divides in attitudes about the Planned Parenthood issue and in views of a budget compromise more generally. About eight-in-ten Democrats (83%) and 64% of independents say any budget agreement must maintain funding for the group. 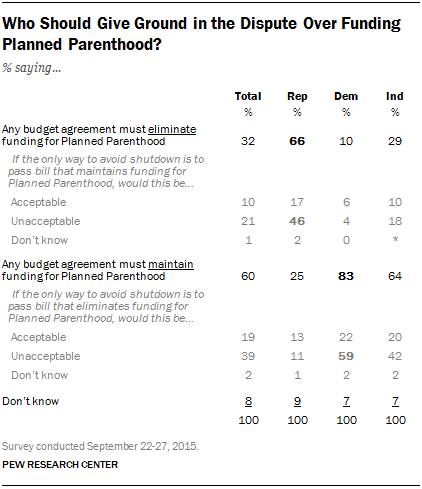 Two-thirds of Republicans (66%) say any agreement must eliminate Planned Parenthood funding. As in prior budget showdowns, the public generally favors compromise. Most Americans (58%) want lawmakers who share their views to be willing to compromise, even if that means passing a budget they disagree with. Just 36% want lawmakers to stand by their principles, even if it means the government shuts down. Opinion on this measure was nearly identical in the days before the October 2013 partial government shutdown (57% compromise vs. 33% stand by principles). As was the case in 2013, Democrats (73%) are far more likely than Republicans (40%) to say that the lawmakers who share their views should compromise, even if it results in a deal they disagree with. Modest attention to budget debate. 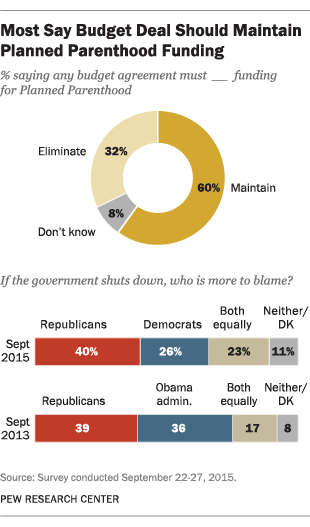 The prospects of a government shutdown have not registered widely with the public. About a quarter of Americans (26%) say they have heard a lot about the budget debate and possible shutdown, while 38% heard a little. Roughly a third (36%) say they have heard nothing at all about the budget fight and a possible shutdown. 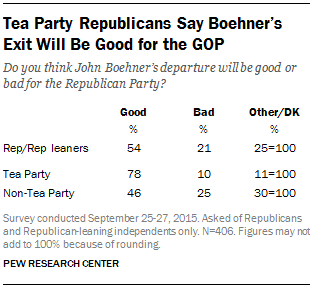 More signs of GOP discontent. Job ratings for congressional leaders of both parties are low – 34% approve of the job performance of Democratic leaders while just 19% approve of the way Republican leaders are handling their jobs. Republicans’ ratings of the job performance of their party’s congressional leaders have plummeted this year – from 50% in February to 32% currently. About twice as many Democrats (65%) approve of the way their party’s leaders in Congress are doing their jobs. Abortion views little changed. 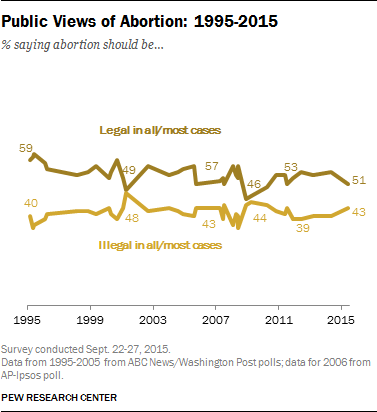 Among the public overall, opinions about whether abortion should be legal or illegal in all or most cases have changed little over the past year. Currently, 51% say abortion should be legal in all (20%) or most (31%) cases, while 43% say it should be illegal in all (18%) or most (25%) cases. However, support for abortion has declined among conservative Republicans over the past year: Just 16% say it should be legal in all or most cases, down from 32% a year ago. In October 2013, after a partial government shutdown had begun, the public was divided over the outcome of a possible budget agreement. At that time, when the Affordable Care Act was at the center of the disagreement, 44% said Republicans should agree to a budget deal without cuts or delays in the health care law, while 42% said President Obama should agree to cuts or delays in the law. Today, by a margin of almost two-to-one (60% to 32%), the public says any budget agreement must maintain funding for Planned Parenthood. But there are wide age and ideological differences in these opinions. Majorities across age groups, except for older adults, say any budget agreement must include Planned Parenthood funding. Those ages 65 and older are divided, with 46% saying that any budget deal should maintain Planned Parenthood funding, and 41% saying it should eliminate such funding. Republicans are internally divided over whether any budget agreement must include Planned Parenthood funding. Nearly eight-in-ten conservative Republicans (78%) say any budget agreement must eliminate funding for Planned Parenthood, twice the share of moderate and liberal Republicans (39%). Comparable percentages of Republicans (30%) and Democrats (26%) say they have heard a lot about the budget debate and a possible government shutdown. Among those who have heard a lot about the issue, 43% say any budget deal should eliminate funding for Planned Parenthood, roughly double the share among those who have heard nothing about the debate (21%). While there is broad support for a budget compromise in principle, most of those on both sides of the Planned Parenthood funding dispute say they are unwilling to give ground when asked a follow-up question about the specifics of the issue. Among the roughly one-third of adults (32%) who say any budget agreement must eliminate funding for Planned Parenthood, a majority – a group that constitutes 21% of the public – say it would be unacceptable to agree to a budget that maintains funding for the group, if that were the only way to avoid a government shutdown. Conversely, most of those who favor maintaining funding for Planned Parenthood (39% of the public overall) say it would be unacceptable to agree to a budget that eliminates funding for Planned Parenthood. Among all Democrats, 59% say that it would be unacceptable to agree to a budget that eliminates funding for Planned Parenthood, if that were the only way to avoid a government shutdown. Among all Republicans, 46% say that any budget that funds Planned Parenthood would be unacceptable, if that were the only way to avoid a shutdown. 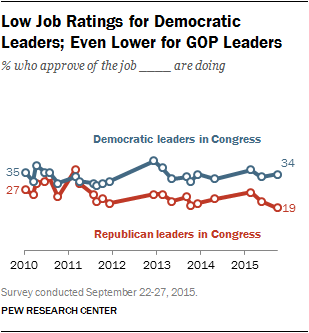 Approval of the congressional leadership of both parties continues to be low among the public. In particular, ratings of Republican leaders are far more negative than they are for their Democratic counterparts. Today, 34% of Americans approve of the job Democratic leaders are doing, while just 19% approve of the GOP leaders’ job performance. 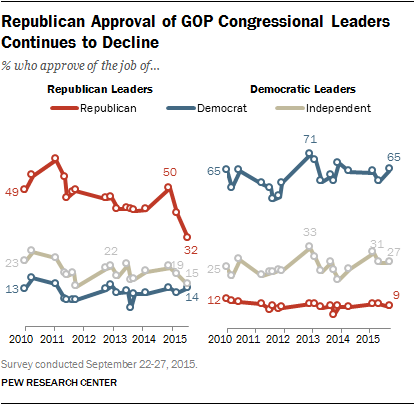 Republicans’ ratings of their own party’s leadership have declined once again, hitting a record low. Today, just 32% of Republicans approve of their party’s congressional leaders down from 41% in May and 50% in February. Just 15% of independents rate Republican leaders in Congress positively, which is little changed from May and six points lower than in February. Democratic congressional leaders also do not fare especially well among independents; 27% approve of their job performance. Among Democrats, though, ratings of their own party’s leadership are much more positive than Republicans’ ratings of GOP leaders. Nearly two-thirds of Democrats (65%) approve of the job performance of Democratic leaders. Overall views of abortion have changed little in the last year. Currently, around half of the public (51%) says that abortion should be legal in all or most cases, while 43% say it should be illegal in all or most cases. In September 2014, a slightly larger share of Americans was in favor of abortion in all or most cases (55%), while 40% were opposed. There continues to be a substantial partisan gap in opinions about abortion. Democrats express strong support for abortion by a wide 68% to 27% margin, while Republicans show opposition to abortion by a nearly identical 67% to 28% margin. Republican support for abortion has fallen over the past year, from 37% to 28%, with virtually all of the decline coming among conservative Republicans. Today, just 16% of conservative Republicans say abortion should be legal in all or most cases, the lowest share among this group since the question was first asked in 2007. 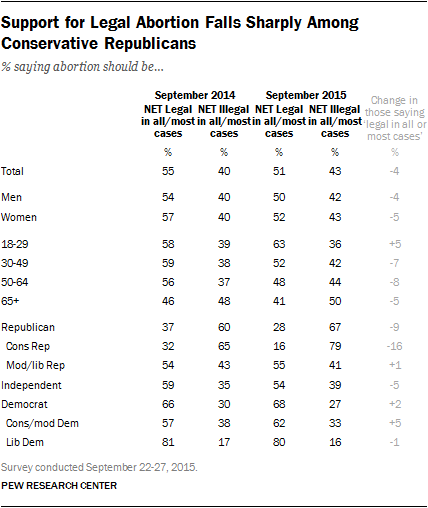 A year ago, twice as many conservative Republicans (32%) said abortion should be legal in all or most cases. There are widening age differences in opinions about abortion. About six-in-ten (63%) of those younger than 30 say abortion should be legal in all or most cases, the highest share of any age group. Just 41% of those 65 and older support abortion, down from 46% a year ago. In contrast to the wide partisan and age gaps, there is virtually no difference in views of abortion among men and women. Roughly half of both genders—50% of men and 52% of women—express support for abortion and a slightly smaller share (42% of men, 43% of women) are opposed.